The bag design is effectively split into two. The top third features a white background and the brand name. The remainder is flavour colour coded with the detail written in a nicely contrasting colour. The remainder is a mildly comical image that represents the flavour. It is not entirely original, but it is striking and the shelf visibility is very good. There was a hard and slightly brittle Crunch that degraded at a swift but still reasonable pace. The overall degradation was even with no mush but rather mulch. These were thickly cut with an outstanding array of oil blisters. There was a good smattering of darkish seasoning on an orangish coloured surface. There was also skin on most edges. The first notable flavour was a very Asian influenced backdrop. This was accompanied by a meaty flavour that was fairly reasonable Beef representative. There was also a very well balanced sweetness with a hint of heat - So, yes, both Mustard and perhaps even Honey. 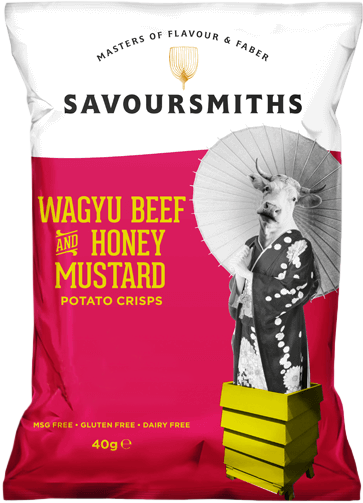 The combined assessment was a fairly decent effort of representing a fairly complicated flavour balance with what is a pretty original Crisp flavour and a most welcome addition to the UK’s brilliant range of Crisps.